Here is a tip from Twin Squeaks Gerbils that I really liked. Enjoy!! Most of us like to have good photos of our favorite pets, but gerbils can be very difficult to photograph. This is because of their small size, because they live inside glass tanks, and because they move so quickly! In this tip, we'll provide some tips for taking better photos of your gerbils. Most of these tips are written with digital cameras in mind, but even if you use a film camera, you should find some helpful tips here. 1. If your camera has a macro mode, use it. Most digital cameras have a setting called macro mode . This setting lets your camera focus on closer things than it otherwise could. You may not need macro mode when you take a photo of a larger animal such as a dog, but when you photograph a tiny gerbil, macro mode can help your camera focus on the little guy. 2. If you're shooting through the glass walls of your gerbils' tank, shoot at an angle rather than straight on. If your flash fires straight at the glass, the light will reflect off the glass, and instead of seeing your gerbils in the picture, you'll see a bright blob of light. By shooting at an angle, the flash bounces off the glass and away from you. 3. Hang an aquarium background. There are many aquarium backgrounds available at your local pet shop. These will add some color to your photos and make them more interesting. Some of the best backgrounds for gerbil tanks are ones designed for reptile tanks! This is because reptiles, like gerbils, are at home in desert settings. You can often find aquarium backgrounds with sand, cacti, and desert plants. 4. Give your gerbils something to do. Give your gerbils a treat, a new toy, or a toilet paper tube before you start taking pictures. You'll have better luck getting a gerbil to sit still for photos if he's happily munching on a Cheerio or if she's busy tearing apart a toilet paper tube! 5. Press the shutter button halfway down and then wait. 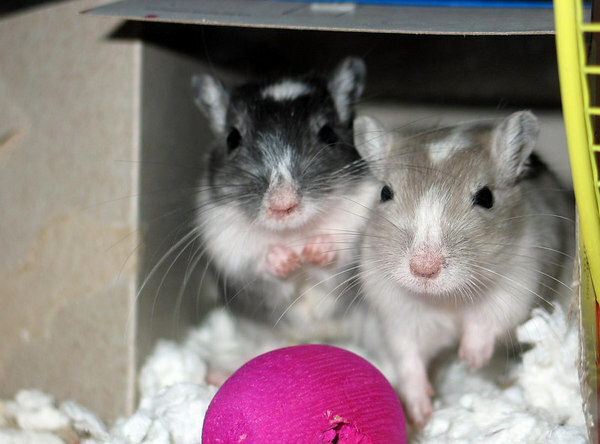 Your gerbils will probably move too fast for your camera to focus and snap the photo. You can get around this by pressing the shutt button down halfway so that your camera focuses. Then hold your camera still and wait for your gerbil to walk into the frame before you press the shutter button down the rest of the way. 6. Give your gerbils a small cardboard box. This is one of our favorite tricks. Give your gerbils a small cardboard box right before you start taking pictures. Your gerbils will crawl into the box to explore it. Aim the camera at the edge of the opening to the box, press the shutter button halfway down so that your camera focuses, and then wait for your gerbils to poke their heads out of the box. As soon as one of them pokes his or her head out, snap the photo. 7. Crop your photos. It's easier to get good gerbil photos if you don't zoom your lens all the way in. You can always use a photo-editing program later to crop the extra background out of your pictures so that the gerbil's up closer and framed better. 8. Take lots of pictures. Don't get discouraged if your gerbils often jump out of the way before your camera captures the picture or if you get some blurry shots. The more pictures you take, the more likely you are to get lucky and capture one really good picture. You'll also get better at predicting your gerbils' actions so you can plan where you need to focus the camera. Don't get upset if you don't get many good pictures. Just keep trying, and you're bound to get a few good photos of your gerbils! 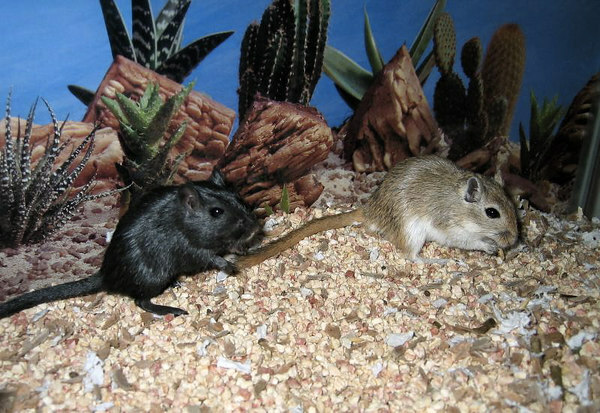 The gerbils are super cute!